I think we should be allowed to have any type of weapon we chose but that's just me and yes I know that's crazy. But I like freedom. Even the freedom to hurt myself and others is important to me. That being said the ,"I need a gun to protect my family from the government ." argument is just silly in our age. 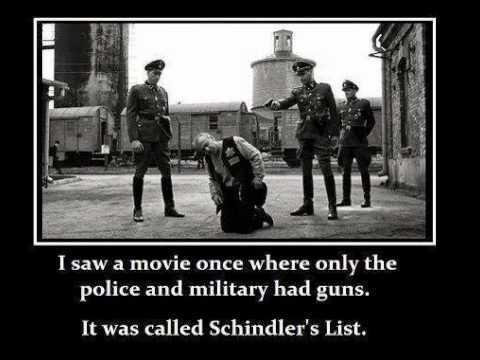 An ak will do nothing to protect your family if the government sends in tanks and drone strikes your house. We do not have the ability to fight the us military as a militia. We stopped being equal in firepower to them a long time ago. I would argue that hunters need guns to feed themselves. I would argue that I need a gun to protect my family from citizen home invasions, not the government. The purpose of the 2A is EXACTLY that, to keep the government in check. Not about a lone wolf taking on the government but a collective of citizens (militia) to prevent this from happening.. If you actually think "in this day and age" this couldn't happen again then you are woefully naïve. You might want to do some more research before using that image as an argument. RKBA.Org, a pro-gun rights organization, lists it among the top gun control urban legends. You'll have to hunt through their long list (FAQ) but basically he just disarmed the Jews. And countries he conquered. And only after he'd been in power for awhile. I didn't say it couldn't happen. In fact I specifically stated that I believe that the US military could kill every man women and child in america if they choose to, and there would be little any of us could do to stop it. I agree that the original reason for the 2ed amendment was to give citizens an equal footing during battle. But if you think we are still equal, then I would say you are the naive one. Do you honestly believe a militia of 1 million men carrying fully automatic weapons is going to stand up to 100s of tanks? How about missiles? You going to shot down fighter jets with your fully automatic? Can bullets reach a stealth bomber? You are living in a dream world if you think that arming every last man women and child with an ak47 is going to stop the US government if the military sides with them. The only chance we would have if the government attacked the US citizens would be if the military sided with us. These facts are why the left laughs at the right when they try and hold up "defense against the government" as their main argument for owning fully automatic weapons. There are much better and more intellectual arguments for owning weapons you could be using. For example, many americans hunt, many americans are collectors, guns are excellent home intruder (from citizens) defense tools. Only a foolish liberal can try and argue with those points. My personal reason for owning guns is that I believe that sane humans don't use guns for violence except in defense , no mater how mad they get. Crazy people will kill people no mater what we do. Yes it's a cliche but guns don't kill people, people do. And I truly believe that. You obviously didn't read any of my other comments nor did you understand the one you quoted from if you think I want guns to be taken from anyone for any reason. If it gets to the point that the government “tries” to use the military or national guard at a massive scale against citizens then that means there are social and/or economic catastrophic events underway. The military will fragment and basically we end up in a second civil war and the playing field levels. Afghans have been very effective against two superpowers. You under estimate both the psychological and tactical advantages the 2A provides in keeping the government in check. Why do you think the left so desperately wants to ban guns if they pose no real threat? Citing only hunting and self defense weakens the 2A’s justification and revelance. Both of those can be whittled away with the fact that a very small percenatge of people hunt, self defense in cities is unnecessary and guns in large population centers create more problems than they solve, etc, etc. I would rather argue the true purpose of the 2A, centuries of human history prove that governments become corrupt and ultimately become tyrannical in the hands of a very small group of elite and their puppets. “...but basically he just disarmed the Jews”. Yeah, a group of people deemed to be “undesirable” by the government. All that I gotta say is: I can make my own muzzle loader. Yeah, and cannons ... I have some too ... self made. Why cannot a person just have a loud hobby anymore without ban threats?